Popping out for a bite to eat recently, I stopped into a branch of Pret a Manger. Since it was icy cold outside, my fingers needed some warming up and what could be better than a pot of soup? 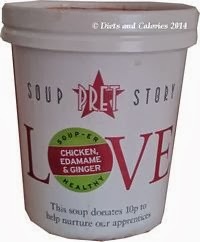 I hadn’t tried any of the Pret soup range before and once I saw the varieties available, I couldn't resist buying one. 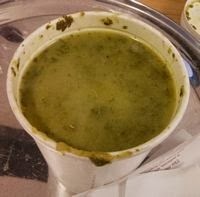 Each day Pret have three different soups on sale, but this particular day there were two to choose from: Chicken, Edamame & Ginger Soup with 137 calories or Kale, Leek & Nutmeg for 122 calories. While I stood dithering between the two, my friend also spotted them and went for the Kale soup. That made my decision easy - Chicken, Edamame & Ginger for me. And how glad was I. 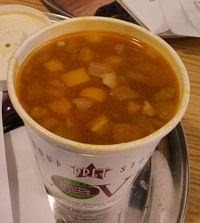 This has to be one of the best takeaway soups I’ve ever eaten. With only 137 calories, I was expecting a thin, watery soup with maybe a few bits of shredded chicken and the odd edamame bean floating about. I couldn’t have been more wrong. This soup was chock a block with shredded chicken and chunky vegetables including onion, tomato, yellow peppers and edamame beans (lots). It’s all simmered in a roast chicken stock with brown rice, sweet tamarind, ginger, black pepper and Maldon sea salt. It’s a beautiful rich red colour with just enough of a ginger zing so as not to overpower the flavour. Every spoon is so brimming with vegetables AND chicken, that it's more than a soup – this is a meal. With a small fruit salad afterwards, this set me up for the afternoon. Although I haven’t tried any other soups so far, my friend enjoyed her kale, leek and nutmeg soup which was also very thick and fulfilling. The only comment she had was it could do with a bit more nutmeg as it wasn’t particularly noticeable. At the time of writing, Pret a Manger are updating their menu so it's possible some of their soups may not be available for too much longer. Nutrition Information: Per 370g pot: 137 calories, 8.9g protein, 20g carbs, 6.3g sugars, 1.9g fat, 0.4g saturates, 0.92g sodium.